Submitted by Gina Asprocolas on Mon, 11/14/2016 - 14:46. The Teacher & Principal School Report series showcases the results of a national survey of more than 4,700 public school Pre-K–12 educators on critical issues affecting schools and districts across the country. With two in-depth reports, Scholastic has explored equity in education as well as literacy, each with a special look at factors from both inside and outside of the classroom. The Teacher & Principal School Report series is for educators, families, community partners, policymakers, and education stakeholders. The goal of the report is to elevate the voices of educators and raise awareness of the barriers to equity in education and the resources needed to support students and families, including the importance of literacy. 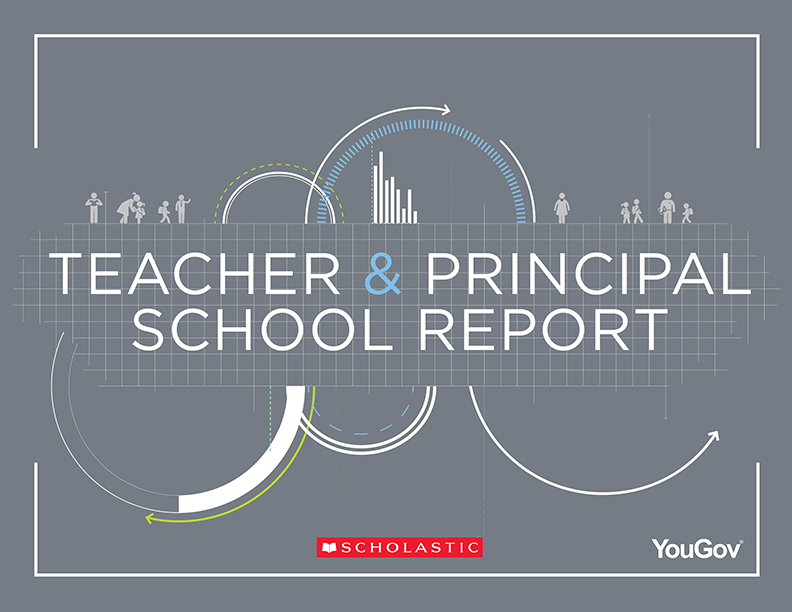 The findings reported in the Teacher & Principal School Report: Equity in Education are based on a national online survey managed by YouGov among public school Pre-K–12 teachers (3,694) and principals (1,027). The survey was conducted between July 22, 2016 and August 26, 2016. The data was weighted on gender, years of teaching experience (teachers only), school grade range, district enrollment, school urbanicity, and percentage of students receiving free/reduced-price lunch. School poverty levels were determined by NCES definitions of high- and low-poverty schools, based on the percentage of students eligible for free/reduced-price lunch, i.e. low poverty (0–25%) and high poverty (76%+). The full methodology is available when you download the full report. The overwhelming majority of teachers and principals agree that “providing year-round access to books at home is important to enhancing student achievement” (96%) and that “students should have time during the school day to read a book of their choice independently” (94%). In school, teachers are most likely to promote reading by talking with their students about literacy and the books they read, as well as encouraging use of the school library. Outside of school, teachers are most likely to encourage summer reading and make books available to take home during the year. Principals are more likely than teachers to host or participate in a book fair and make books available for students over the summer. While 77% of teachers set time aside for independent reading/read aloud, only 36% do this every school day. When this occurs, students spend 22 minutes on average engaging in independent reading/read aloud. 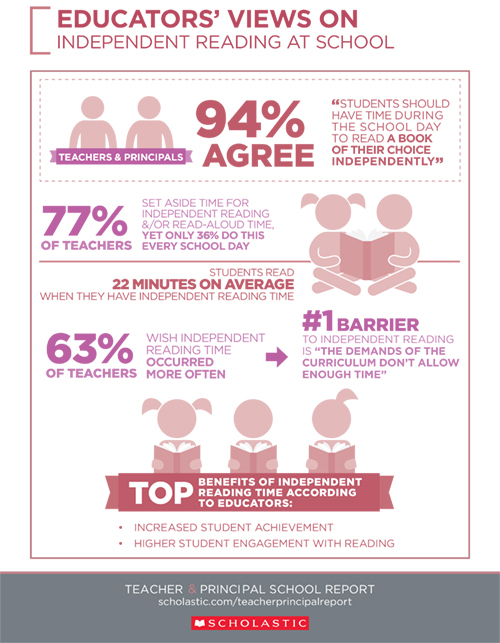 Nearly two in three teachers (63%) wish independent reading/read aloud time occurred more often, and these teachers cite demands of the curriculum as the primary barrier to preventing independent reading from occurring more frequently (90%). The overwhelming majority of teachers (91%) prefer to use a combination of engaging print and digital resources for instruction rather than a basal textbook, and 97% of principals share this preference. Seven in 10 educators (69%) say encouraging reading at home is among the most important things they do to help families be engaged with children’s learning, yet only 51% say this is happening to the degree it should. About half of educators (46%) say their students do not have adequate access to fiction or nonfiction books at home. 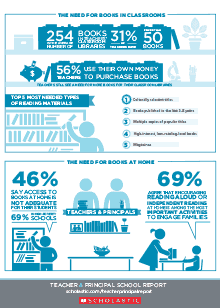 Nine in 10 educators (91%) agree that schools play an important role in expanding access to books at home. Many teachers’ classroom libraries contain more than 150 books (41%), but 31% have fewer than 50 books to serve their students during the school year. Among all classroom libraries, relevancy may be lacking. Regardless of classroom library size, most educators are in need of culturally relevant titles (54%), books published in the last 3–5 years (51%), multiple copies of popular titles (48%), high-interest, low-reading-level books (48%), and magazines (48%). More than six in 10 educators (64%) promote literacy among students by encouraging summer reading — particularly those in elementary schools (77%). Educators say the public library is the number one source of access to summer books for kids (77%). Additional sources, though less frequently cited, include families purchasing books for their children (40%), teachers providing books to take home (22%), and schools and districts providing books to take home (17%). Teachers and principals agree (97%) that equity in education should be a national priority. Teachers and principals also agree (87%) that many of their students face barriers to learning that come from outside the school environment. High percentages of principals across all poverty levels say they have students who are experiencing family or personal crisis (95%), in need of mental health services (91%), living in poverty (90%), coming to school hungry (85%), and in need of healthcare services (82%). Although resources that help address barriers to learning are reported as not adequately available in many schools, the largest disparities based on school poverty levels are in access to fiction and nonfiction books at home (69% of educators in high-poverty vs. 20% in low-poverty schools say these are not adequately available) and family involvement in student learning (68% vs. 18%). Principals’ top funding priorities are investing in academic or social-emotional intervention initiatives and programs (60%), professional development (49%), student access to wrap-around services (48%), additional high-quality staff to reduce student-to-teacher ratio (47%), and early learning initiatives and programs (47%). Teachers’ top funding priorities are additional high-quality staff to reduce student-to-teacher ratio (55%), high-quality instructional materials and textbooks (55%), technology devices and digital resources in school (47%), higher salaries (47%), and academic or social-emotional intervention initiatives and programs (46%). On average in the past year, the teachers in the survey spent $530 of their own money on items for classroom or student use, with teachers in high-poverty schools spending $672 and teachers in low-poverty schools spending $495; principals spent $683, with those in high-poverty schools spending $1,014 and in low-poverty schools spending $514. Only 46% of teachers in high-poverty schools receive discretionary funds from their school, district, or parent-teacher organizations, compared to 61% of teachers in low-poverty schools. 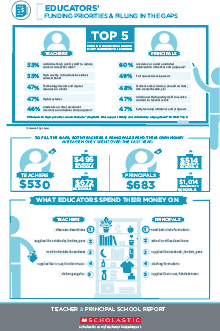 More than half of teachers (56%) use their own money to purchase books. The most needed types of books for their classroom libraries are culturally-relevant titles (54%), books published in the last 3–5 years (51%), multiple copies of popular titles (48%), high-interest, low-reading-level books (48%), and magazines (48%). The needs are fairly similar for school libraries as reported by principals and school librarians, particularly in terms of the need for books that reflect cultural diversity. Ninety-nine percent of educators agree that “it is important to student success that families be involved in their children’s learning,” yet 74% percent say they need help engaging the families of their students. This need is especially great for teachers (84%) and principals (88%) in high-poverty schools, but is still prevalent in low-poverty schools (55% and 57% among teachers and principals respectively). Forty-seven percent of educators say that professional development on ways to work effectively with families from all cultures is among the most important things educators should do to increase family engagement, yet only 27% say this is happening to the degree it should. Maintaining ongoing, two-way communication with families is considered the most important activity educators should do to help families be engaged with their children’s learning, followed by many other communication-related activities and events. But, there are wide gaps between the percentage of educators who say communication activities are important and the percentage who say these are happening to the degree they should. Further, 30% of teachers in high-poverty schools say they cannot reach half or more of their students’ families at least once a year. Only 5% of teachers in low-poverty schools say this. Sixty percent of principals say reaching out to community partners to offer services to families is among the most important things to help families be engaged with children’s learning. The most common programs and services that principals say are provided by community partners are mental health services for students (58%), before- and/or after-school programs/childcare (45%), healthcare services for students (44%), and food for students outside of the school day (41%). Principals desire professional development focused on leadership, school culture, and supporting learning, including strategies for leading and motivating staff (62%), strategies for working with families (59%), using data to inform instruction (57%), and strategies for developing a positive school culture (57%). Teachers want professional development that will improve their instructional practice and support a culture of learning, including instructional strategies in my subject areas (57%), incorporating technology into lessons (54%), and strategies for working with families (47%). Ninety-nine percent of educators agree that being a teacher or principal is a “challenging, but rewarding career,” and virtually all teachers (96%) and principals (99%) say that working with students is the “most satisfying part” of their school day. NOTE: Due to limited sample sizes, state-level data are only available for 16 states: Alabama, Arizona, California, Colorado, Florida, Georgia, Illinois, Kentucky, Missouri, New Jersey, New York, North Carolina, Ohio, Pennsylvania, Tennessee, and Texas.